In reality, this is probably less likely to happen than you might think, because, I’ll be honest, I only know one billionaire and he hates golf. But lying there alone in the dark, my mind decided to give it a shot: what would my own, personal golf course look like? What elements would I include? What things do I like about courses, and what not? Will anyone give a hoot if I write about it? First of all, I’d build in lots of elevation… mainly from tee down to green. I love downhill holes. They look prettier, the ball goes farther, they make nice photos. There’s a hole at Bighorn in Palm Springs that measures 505 yards, with a 180 foot drop from tee to green, so it’s a par 4. You drive the ball and it looks like it’s going to carry to Arizona. In fact, I’d make that hole my first hole at Jimbo Cliffs… just buy it and move it to my course. Of course, we have a lot of shoreline, so many holes would skirt the sea… but not so high above the beach that you couldn’t admire the sunbathers below. All the way along the cliff edge, though, would be waste bunkers, to stop most balls from rolling or bouncing off the course. On the other side of these fairways would be tall trees, whose branches start growing around the 20-foot mark, so that if you hit it off line, you still have a chance at a creative forward shot. Come to think of it, most of my trees would be palms, anyway. My fairway bunkers would not be like the bunkers built by so many courses over the last two decades… these big deep caverns with high walls, that force you to hit no more than eight iron when you still have 200 yards to the green. My fairway traps will give you a chance to redeem yourself for your errant shot, and be a hero if you can hit the green. Now if it sounds like I’m building a course where everyone can break par, not so. I like relatively narrow fairways, bunkers around greens (here, they can be deep), and lots of water… ponds and creeks, as well as a couple of holes hitting over the sea. 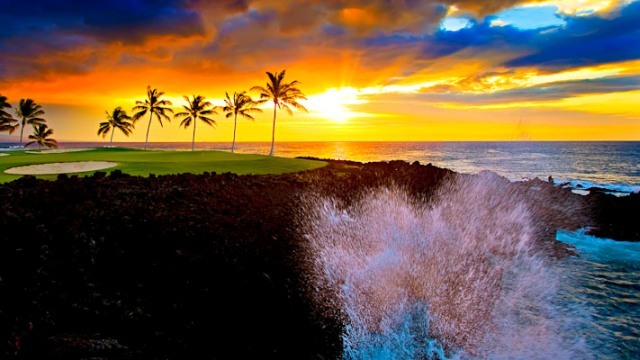 One of my other transplanted holes would be the magnificent par three 3rd from Mauna Kea in Hawaii, that offers a 180-yard carry over the Pacific. The terrain on my fairways would be harder, like links courses, with little bumps encouraging a deft ground game. My greens would not be large, and certainly not roller-coasting. I love older courses where the greens look almost flat, and the breaks are hard to see. But breaks there would be… the kind of surfaces you’d like to play again and again, to get to know the rolls, like studying a masterpiece of fine art, or savouring an expensive wine. But none of my greens would be crowned, like the ones Donald Ross is mostly blamed for. I’d plan on 6 par 3s, 8 par 4s, and 4 par 5s, par 70. This makes it just a bit easier to break 80, or 90, or 100, which means, you go home happier with your score. Players would be expected to walk, and encouraged to roll their complimentary push-carts across greens instead of around them, like they do in the UK and Australia. (This avoids wearing down and scalding aprons.) Motorized carts would only be allowed to people bearing a doctor’s certificate, but for really elevated tees, we’d have a series of Acorn stair lifts, operated by those lovely old folks from that 2:00 minute commercial on Jeopardy. Every hole would be beautiful, just like my wife. Okay, that just about covers it. I’m falling asleep again.